Long standing family ties between Stuarts Mazda and the Roe Family who have a deep heritage in Irish Motorsports. As part of the partnership, James Roe Jr. has taken collection of the award winning retractable fastback Mazda MX-5 RF. Dublin, October 26th; Stuarts Mazda have deepened their already long standing relationship with the up and coming racing star, James Roe Jr. 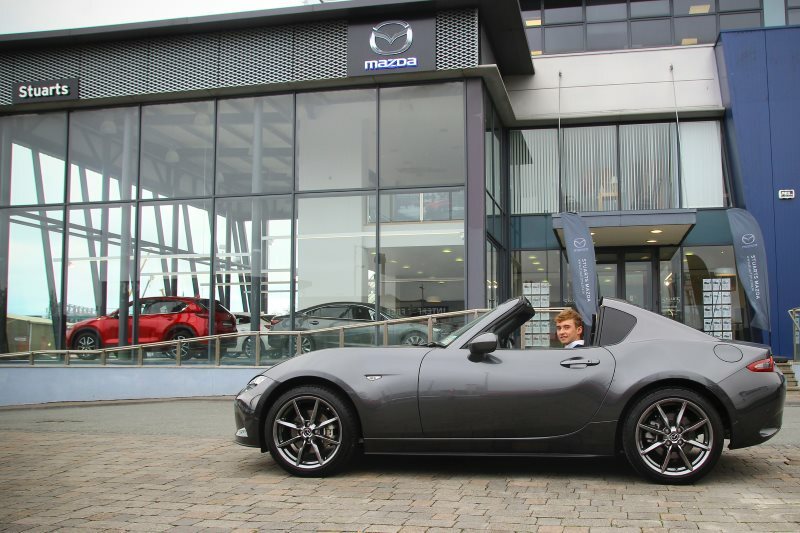 The 19 year old who has made a name for himself internationally in the motorsports world has been handed the keys to a new Mazda MX-5 RF while in Ireland doing press and tending to his sponsorship responsibilities. Though the stunning two seater is a slight departure from the Mazda-powered Elan F2000 race car he is used to driving, it is sure to make him feel at home. Similarly to Mazda, James comes from a long pedigree of race car driving. Hailing from Naas, Co. Kildare he completed four highly successful seasons in Ireland, peppered with wins, podium finishes and lap records before deciding to focus his promising career in the U.S.
After being invited to compete in the Mazda-powered Elan F2000 race car by Arms Up Motorsports, a Wisconsin based team; James has gone from success to success. Winning at the famous Watkins Glen Circuit, the Virginia International Raceway, and the New Jersey Motorsport Park, James also managed to break a seven year old lap record at Summit Point, West Virginia. This all culminated in a 2nd Place finish in the championship, unprecedented achievements for any driver in their first year competing at that level. “After meeting James Roe Jnr for the first time and handing over the Mx-5 RF for him to enjoy, I found James to be very Polite, Respectful and personable character, who has a great passion, pride and drive for his career in Motorsport, I can tell that he will be very successful, and carry his family’s racing pedigree to the next Chapter. All at Stuarts Garages wish him all the best for the future and we will all be following him with great interest.” Jason Phillips, Sales Manager at Stuart’s Mazda.